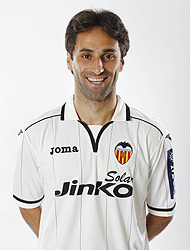 Premier League side Tottenham Hotspur FC are still keen on Valencia CF striker Jonas Goncalves. Tottenham Hotspur are yet to strengthen their attack and are once again looking at Jonas Goncalves as a potential target. In fact they have been interested in Jonas Goncalves for a while now, they had some competition from Liverpool FC, but with the arrival of Sturridge from Chelsea means Liverpool are set in that area now. Tottenham Hotspur are sitting on a lot of cash right now and they do have a lack of quality strikers, with pretty much only Defoe scoring goals for them, so Jonas could be a good option, though they'd likely try to offload some of the other strikers they have first so they can be able to purchase new players. Other reports also link Jonas going back to Brazil, though I don't see that happening as on average the Brazilian teams are not that wealthy and I don't see Jonas wanting to go back to Brazil which is a lower level league than the Spanish league.